“Innovation distinguishes between a leader and a follower.” — Steve Jobs. This is true of all things — individuals, companies, countries. Innovation leads, the world follows. With the rise and rise of the Indian startup ecosystem, innovation in India is at its peak —45,444 patent applications were filed in 2016-17 alone. But not all innovation is impactful, or relevant, or even useful. In an attempt to filter the wheat from the chaff, Inc42 has put together the 42Next — a list of the 42 most innovative startups causing an impact in the Indian startup ecosystem. 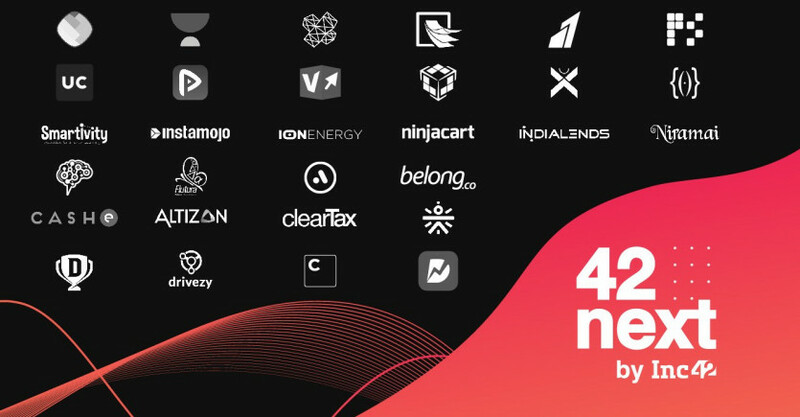 The 42Next is a part of Inc42’s flagship annual report, ‘The State Of Indian Startup Ecosystem 2018’, unveiled during The Ecosystem Summit held on November 16 in Delhi amid the who’s who of the startup community. The 42Next list was prepared after evaluating thousands of startups on criteria such as competition, innovation, revenues, traction, leadership, team, build up, and growth rate, among others. To arrive at the list, Inc42 filtered the essence of its years of understanding on the Indian startup ecosystem and supplemented it with inputs from both the Inc42 Editorial and Inc42DataLabs teams, conducting an in-depth review to recognise the 42 most innovative startups in India. These 42 startups have developed their own patented technologies and are solving pressing problems in areas such as healthtech, fintech, deeptech, enterprisetech, consumer services, edtech, media & entertainment, agritech, logistics, transport tech, and entertainment tech. Altizon is an industrial internet-focussed startup. It helps enterprises use machine data to drive business decisions with a view to enable digital transformation by accelerating smart manufacturing initiatives, modernising asset performance management, and adopting new business models for service delivery. Ather Energy is a maker of two-wheeler electric vehicles. In 2018, the startup launched its flagship electric scooter, Ather 450; and another ebike, Ather 340, which is set to hit Indian roads. It also launched Ather Grid, a public and private EV charging solution. The startup relies on big data to aggregate the right candidates for companies from hundreds of public and social sources. It is a platform-based solution that connects employers to a verified network of independent talent experts for start-to-finish hiring support. CASHe has developed a patented credit scoring system, called social loan quotient (SLQ), to provide short-term, unsecured loans to salaried individuals. The SLQ calculates the customer’s credit score from a number of data points obtained from his/her smartphone that gives insights into his/her willingness and ability to repay the loan. ClearTax helps individuals and businesses with tax compliance and mutual fund investments along with tax preparation, e-filing, accounting, and investment planning solutions. The platform has helped customers file more than 20 Lakh tax returns. The startup has built an automated wealthtech app to help customers plan their finances. It works on a subscription-based model, connecting users with an investment adviser to help them do their financial planning. Cure.Fit is a health and fitness startup that integrates an online-to-offline (O2O) model to offer physical fitness, mental well-being, healthy food, and preventive diagnostics on a single app-based platform. Dream11 offers users app-based gaming experiences in sports such as cricket, football, kabaddi, etc. The fantasy sports platform enables users to create virtual teams comprising real-life players and lets them organise matches based on the players’ actual statistical performances. Drivezy offers peer-to-peer bike and car sharing service in India. Drivezy’s vehicle sharing marketplace is a strategic and efficient alternative to outright vehicle purchase for consumers. Drivezy’s marketplace allows individual vehicle owners to list their idle cars, motorcycles and scooters and turn them into profit-generating assets by renting the vehicles to customers at a fraction of the cost required to purchase a vehicle. Customers can also rent a car or a two-wheeler from Drivezy for hourly, daily, weekly and monthly basis. Chat-based hyperlocal services app Dunzo enables users to create to-do lists and collaborate with partners (vendors) to get them done. It leverages AI to provide vendors for shipping of packages, buying products, repairing stuff, and home services. Flutura is a big data analytics solutions provider with a vision to transform operational outcomes by monetising machine data. Flutura’s flagship software platform, Cerebra, provides diagnostics and prognostics through AI and ML, to unlock new business value for engineering and energy customers across the globe. Apart from furniture rentals, Furlenco provides a host of benefits such as swapping of furniture, relocation across cities, pausing of subscriptions, and deep cleaning services as a part of its subscription. The startup designs and manufactures its own furniture with the help of in-house designers. Graphic India specialises in developing comic superheroes. The startup is producing 200 episodes of animation across TV and digital platforms, and has partnered with Disney, Amazon Prime Video, Cartoon Network, Rovio, Viacom18, etc. Its popular comics include Shadow Tiger, Devi, The Mighty Yeti, Chakra The Invincible, Astra Force, The Lost Legends, and Ramayan 3392 AD. CarIQ connects car owners with the service providers. It is helpful in accessing the car status and detecting any care required in real time. It is helpful in locating nearby workshops and mechanics. It also provides information on insurance renewals, workshop tie-ups, service integrations, and roadside assistance, etc. Consumer lending startup IndiaLends has built a credit scoring and analytics platform that connects borrowers with financial institutions that match their credit profiles. It also provides data analytics and risk scoring services to financial institutions as well as access financial education to consumers. ION Energy manufactures high-performing batteries for electric vehicles. It designs and engineers lithium-ion battery technologies bundled with proprietary software and a cloud analytics platform to improve battery performance. Instamojo enables MSMEs to build, manage and grow their business online. Used by over 500K MSMEs in India, in the last six years, Instamojo has acquired nearly 10% of the digitally active MSME’s. The startup turned EBITDA positive in July 2017 and has witnessed a 10-15% MoM Growth. Technology-powered meat, fish, and seafood products delivery startup Licious is built on the farm-to-fork business model. It owns the entire backend cold chain, which enables it to control and maintain the quality and freshness of the products from the time of procurement, through processing and storage, till it reaches the customer. Key investors: Blume Ventures, Exfinity Venture Partners, BeeNext and growX ventures , Rocketship.vc, Recruit Strategic Partners, pi Ventures and more. Locus is a decision-making engine in supply chain that uses deep learning and proprietary algorithms to provide route optimisation, real-time tracking, insights, and analytics, beat optimisation, and more of packages. Locus aims to automate all kinds of human decisions required to transport a package or a person, between any two points on earth, delivering gains along efficiency, consistency, and transparency in operations. Key investors: Sequoia Capital, SAIF Partners, Y Combinator, Venture Highway, Investopad and others. Meesho is an online social platform for sellers to sell products across fashion, lifestyle, and other categories. It also provides logistics and payments tools to sellers along with helping them launch, build, and promote online businesses using social media channels. Consumer lending startup MoneyTap provides flexible loans to salaried individuals and self-employed professionals earning more than $270 (INR 20,000) per month. MoneyTap claims to evaluate the user’s eligibility in less than four minutes and provides a real-time decision on the application along with the amount the borrower is eligible for. myGate offers a comprehensive solution for gated communities to manage operations at entry and exit gates; and enables them to optimise security guards, making them more effective. The startup takes the responsibility of training the guards — any time and any number of times as needed — through the life of the contract. Founders: Thirukumaran Nagarajan, Vasudevan Chinnathambi, Kartheeswaran K K, Ashutosh Vikram, Sharath Loganathan. B2B agri-marketing platform Ninjacart connects farmers with businesses, picks up produce from farmers’ fields and delivers it to the doorsteps of 3000+ businesses in 12 hours. The startup claims to process more than 200 tonnes of fruits and vegetables daily and has operations in Bengaluru, Chennai and Hyderabad. Niramai uses big data, artificial intelligence (AI) and machine learning (ML) to detect breast cancer at an early stage, which is useful for preventive health checkups. Mobile-based Clip allows users to browse India-based video contents of bollywood, cricket, music, dance, devotional etc. The users can also follow each other, create their own video, find content and share them across other social media. An AI-driven mobile platform, Playment helps organisations divide big work projects into micro tasks. Users need to share data with the startup’s human intelligence (HI) team, which then provides a dedicated project manager that prepares task instructions, workforce training modules, and sets up workflows to ensure that contract level SLAs are delivered consistently. PlaySimple provides simple, fun and social mobile-based games across categories such as trivia, puzzles, and word games. Each game has an average session time of 15 minutes. Quizizz is an e-learning platform for teachers, students and parents to connect and engage with each other to conduct quick assessment across STEM subjects using gamification technique, having features such as points, customisable memes, leaderboard etc. Digital payments startup Razorpay offers payment gateway solutions along with a product suite to help merchants manage the entire payments cycle. It plans to enter the enterprise online lending space with by expanding its existing B2B services to provide an end-to-end financial management solution. AI- and ML-focussed online lending startup Rubique has developed a proprietary algorithm for banks and other financial institutions to process loan and credit card products. Much like other social networking platforms, ShareChat enables users to create, discover, and share content with each other in 10 Indian languages. The app allows users to share videos, jokes, GIFs, audio songs and funny images. The users can also follow each other, create and find content in their language of preference and share them across other social media. ShopX is a technology-led startup that enables retailers in Tier 2 and Tier 3 cities to offer their products and services to customers by listing them on its platform along with daily deals. Key investors: Accel Partners, IDG Ventures India, Endiya Partners, Pi Ventures, Axilor Ventures and more. SigTuple aims to create a data-driven, ML, and cloud-based solution for detection of abnormalities and trends in medical data for the purpose of disease diagnosis. Its continuous learning AI-powered platform, Manthana, enables SigTuple to ingest visual medical data from various devices to detect diseases. Smartivity Labs provides activity-based, engagement-driven smart learning experiences and toys for children. It has built a patented AR-focussed tinkering kit along with robotics-based learning systems for children from 3-14 years of age. Besides India, the startup has distributors in Singapore, Australia, Sri Lanka, Nigeria, Pakistan. Squad has an app that helps Internet companies execute small tasks via crowdsourced game players. Squad assigns these tasks as games to freelancers who play them in exchange for currency on mobile wallets. SquadVoice is seeing strong growth and its product has evolved in the right direction towards automating lead qualification for sales teams. Tesseract has launched three hardware products — Methane, Holoboard, and Quark — in the augmented reality (AR) and virtual reality (VR) sectors. On the AR side, the company is focussed more on content consumption, while in VR, it concentrates on content capture. ToneTag uses sound waves to transmit data to enable payments when two devices — a mobile phone or a PoS device — are brought in close proximity of each other. Unacademy is an online learning platform that empowers educators to create courses on various subjects. It currently has more than 50,000 lessons online, 1.3 Mn registered users, and 4,000 educators. It also provides an online knowledge repository for multilingual education. On-demand hyperlocal home services marketplace UrbanClap helps consumers find local home services in categories such as health and wellness to weddings, events, home and design, repair and maintenance, etc. UrbanClap recently launched its services in Dubai. Vatsana Technologies-owned content marketing company Wittyfeed is a content marketing platform that provides latest news, photos, viral stories, and trending videos on entertainment, fashion, sports, politics and lifestyle. The content is available in Spain, the US, the UK, and India. IoT-focussed startup Yulu provides dockless bicycles sharing for the first mile, last mile, and short distance commute. Its bikes can be unlocked by scanning the QR code that is obtained after the user books the ride via the Yulu app.